“You would be camping in the Thar desert for the night,” said the manager of the guest house when I asked him about the camel safari in the Thar desert in Jaisalmer. I enrolled for camping as the thought of stargazing in the night was too tempting to resist. I joined a group of 7 to 8 people later and we started off in the afternoon. The hot weather didn’t dampen our spirits. These people had already met the last night in another guest house and I was the newbie in the gang. 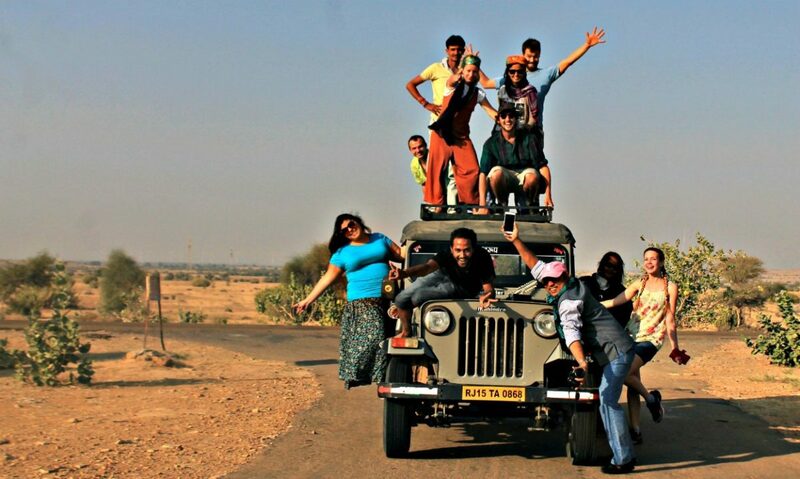 We began chatting as we left Jaisalmer city and the jeep safari in Jaisalmer to the Thar Desert National Park had begun. Where is the Thar Desert? And Why You Should Visit? The Thar Desert is world’s 18th largest desert and the biggest desert in India. It is spread across 5 states in India in the north to the west, with a majority of the area lying in Rajasthan, where the Thar Desert National Park is located in Jaisalmer. Apart from forming a natural border with neighboring Pakistan, the Thar desert is one of the top places to visit in Jaisalmer. 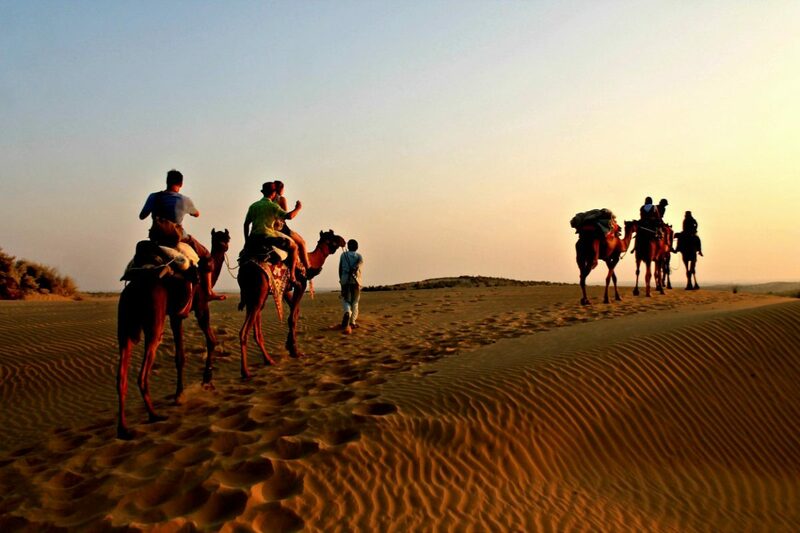 Being the main part of Jaisalmer tourism are the camel safari and the Thar desert camp experiences. Now, read further to know more. It was a fun ride, and the terrain changed dramatically as we entered the desert area. 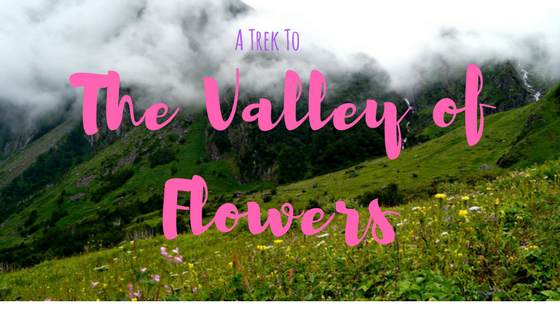 Vegetation was sparse, it suddenly felt hotter, and on either side of the road was a vast stretch of land that was dominated by just two shades of brown – dark and the light, and some green. We stopped to take some photographs. This was my first time in a desert and a landscape with not many things was something new to me. We passed through a few homes, all of them built in a typical traditional Rajasthani style. I loved the simple yet elegant design of these homes. The road narrowed and the offbeat ride began, and soon we were going amidst sand. It was a thrilling ride that led to the mouth of sand dunes. I sat upon Kali, and she led the safari. I felt scared in the beginning and the sudden ups and downs were uncomfortable. I slowly got used to it. In front of us was the great Thar desert, which spread wide and far. The sand dunes looked beautiful with the natural patterns upon them caused by the wind. Kali walked with grace and ease lifting her legs off sand rhythmically. The sun had begun to go down and our guides led us to the best spot to witness the sunset. I felt relaxed as the cool wind brought the heat down. The colours changed in the sky – bright yellow was looking mellow and shades of light red appeared on the horizon. The rising sand dunes looked like they were very close to the sun. From far it looked as if the sun was getting down to disappear amidst the sand dunes! Speaking of the sand dunes, we had reached Sam sand dunes, a perfect place for watching the sunset. Sam dunes are the largest dune site in Jaisalmer, with 45 to 50m tall dunes over which our camels passed. Most of the campsites in the desert are located within a 2km to the 3km radius, including many luxury tents in Jaisalmer desert. 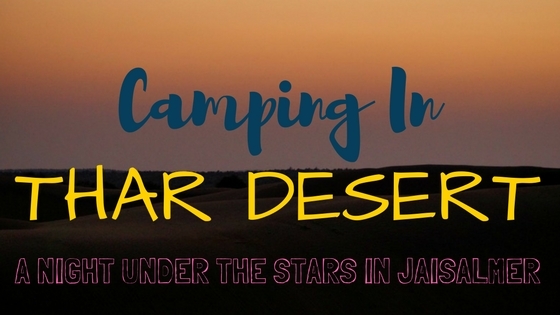 If you opt for any of the desert safari tours or any Jaisalmer desert camp package, you are most likely to spend the night close to the sam dunes, which is just an incredible experience! Camel safari was super fun. I watched one of the most splendid sunsets that I have ever seen, my first in a desert. The hues added many colours at once to this landscape as if to make up for the colours that the desert missed. Surrounded by a barren land around me and a galaxy of stars above, a sense of nothingness and emptiness passed through my thoughts as the night set in. The desert itself evokes these emotions and as thousands of stars take over the night sky, you can’t help feeling like a tiny spec of dust in this huge space called the universe. 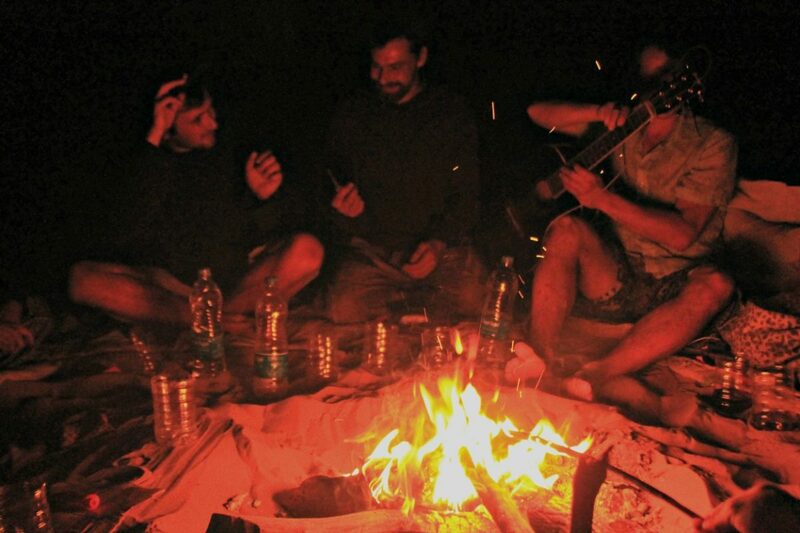 With the night came the chilling cold, and we soon ran to gather around the bonfire. The cold increases in no time and reaches a point where you become so cosy in the bonfire area that even a step beyond it looks like you have ventured into a freezer. The couple from Russia began singing as the guy started playing the guitar. Everyone joined humming. Hot tea was followed by snacks, which got replaced by drinks and food later. Travel stories – funny, scary, bizarre and adventurous stories unfolded. We ran bare feet with on the sand, calling out names in the dark and made funny noises that echoed so well before drifting away. We all decided to get away from any tents. We wanted to experience how sleeping literally under the stars would be – no roof above, no cosy bed below. After we monkeyed around enough until we got exhausted and it was well past the midnight, we retreated. I sneaked into my sleeping bag to sleep, wearing three layers over me. It felt magical to lie down and gaze at the galaxy of stars. The canvas of stars will remain with me for long, adding to my incredible experiences in Rajasthan. Thank you, Jacob, Pippins, Alex, Devilal, Ismail and Kochynvsky for making this an incredible trip for me! 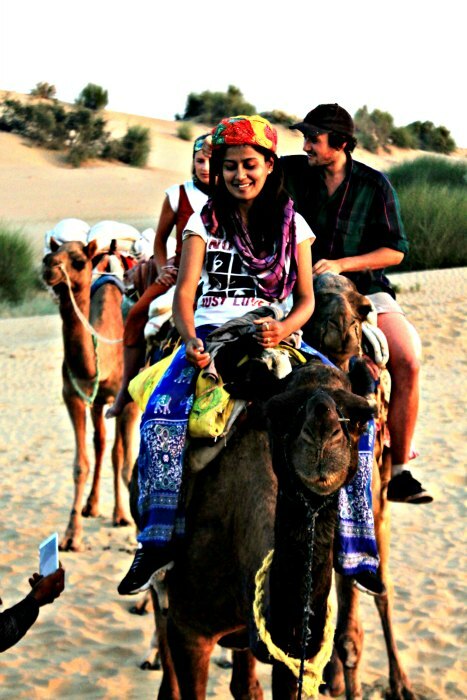 I think it’s an experience to add to your list while doing your Jaisalmer sightseeing. Camp in Jaisalmer at least for a night and I am going bet that it’s going to be memorable! Quick tips: Even if you are going solo like you, tag along with large groups – camping is always more fun when you have a bunch of crazy people along with you! 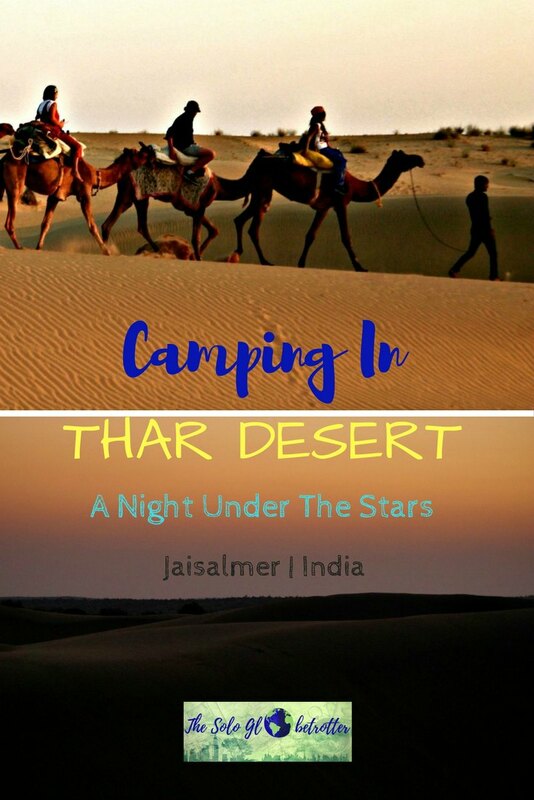 Camping in Thar desert is a must experience while in Jaisalmer, and many small and big tour companies organise this overnight or day tour every day. The prices are more or less the same, although it’s advised that you bargain well. It should not ideally cost you more than 1400 to 1500 INR, depending on what you opt for. Make sure you decide and check with the organisers on how you want to camp and the things included in the cost. There is no need to book anything in advance as it means you have to pay upfront and you might lose money if you change your plan later. So go around the city once you land in Jaisalmer, check with at least 3 places to compare costs, go through their reviews (most have reviews on Tripadvisor) and then take a call on the booking. 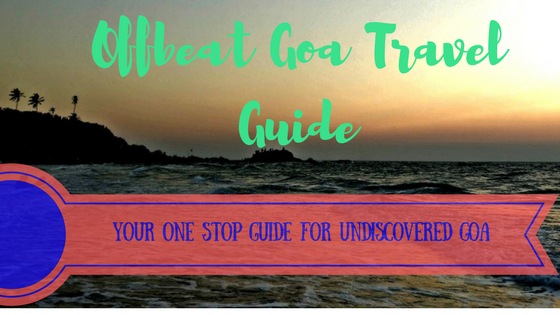 Subscribe to My Posts For Travel Inspiration, Tips, Travel Guides & Stories. No Spam.